We’ve all been there – we’ve just made a mistake, and we need to know how to “fix” it. In this episode I talk about what to do when you’ve blown it. You’ll get some practical tips about how to clean up the mess that will leave you in a better place! Announcer: [00:00:00] Season 2, episode 2. Dr. Bamberger: [00:00:11] [inaudible 00:00:11] take an engineer and you want to turn them into your leader in an organization, you can’t just assume that you promote them and they’ll sort of learn over time how to become a leader. Dr. Bamberger: [00:00:23] Some of them will. The vast majority won’t. Tom: [00:00:26] Some of them will. But the vast majority won’t. So here you are. You’re a talented engineer. Maybe you’re running a team of technical folks. But the fact is, they won’t magically get better at things like communicating clearly, or delegating effectively, or dealing with conflict in a healthy way. They need to learn those skills. [00:00:49] That’s why I created Geek to Great 101. It’s a simple way for you to help your team members with an easy plan to improve these skills and more. For less than $500, your team can start to make progress. Find more information and get immediate access to your first free lesson at brighthillgroup.com/helpinggeeks. That’s brighthillgroup.com/helpinggeeks. [00:01:17] Welcome to the Becoming a Geek Leader podcast. My name is Tom Cooper. As a geek, I’m on a mission to figure out better ways to lead others at work and at home. Through the Becoming a Geek Leader podcast I’m sharing what I’m learning so I can help make you more effective at leading people, too. Ready? Reporter: [00:01:39] The space agency says tonight, that a multi-million dollar spacecraft, sent to explore the atmosphere of the planet Mars, has been destroyed. It’s a setback to years of work already done. In the vastness of space, all it takes is one navigation error. In this case, NASA was off by 60 miles. Tom: [00:02:00] Nobody likes to make mistakes, especially not those of us who have any sort of technical or engineering background. But as the Mars Climate Observer spacecraft debacle shows us, none of us is immune from making mistakes, even rocket scientists. [00:02:17] The spacecraft crashed into the Mars’ surface instead of going into orbit properly. Why? A NASA review board found the problem was in the software controlling the orbiter’s thrusters. The software calculated the force the thrusters needed to exert in pounds of force. However, a separate piece of software took in the data and assumed it was in metric, newtons. [00:02:42] In today’s episode, I’m going to talk about two aspects of making mistakes. The first is, when do you admit it when you’ve made a mistake? And the second is, how should you admit your mistake to others? I also have a special thought leader segment today based on a session I attended at an Agile conference, where we talked about how to deal with a business analyst who made life difficult for her Agile team. [00:03:10] Today’s podcast is focused on lessons you need to learn if you’re at level two of the four levels of Thinking as a Geek Leader. The good news is you will continue to use these lessons on up through levels three and level four. [00:04:14] I’ve got to tell you, I was intrigued as I studied the reaction of the assistant manager. She was wrestling with the facts. It was difficult for her to be able to process what the customer was saying. I could see from the look on her face that she was trying to figure out whether in fact a mistake had actually been made. [00:04:31] Initially, I could tell she was convinced that she was right in counting the items that got put on the customer’s tray, and I could see the emotional struggle she was facing being able to acknowledge that there was a discrepancy. As she processed this input, she began to dispute the customer’s assertion. Now, the customer was confused. The customer insisted that an error had been made. The two of them went back and forth a couple of times and eventually, the customer just gave up and turned to walk away without the French fries. [00:05:23] Maya Angelou said, “People may forget what you say. They will forget what you do. But people will never ever forget how you make them feel.” Now in this situation, I have no doubt the customer felt frustrated, challenged, and maybe even as if they had been called a liar about an order of fries, really? Oh, my goodness. [00:05:45] Now, there are two things you could be sure of when it comes to being wrong. First, everybody’s wrong sometimes. And second, nobody likes it when they’re wrong. Now, Dale Carnegie said, “If you could be certain that you were right just 51% of the time, you could go to Wall Street and make a million dollars a day.” We all make mistakes sometimes. 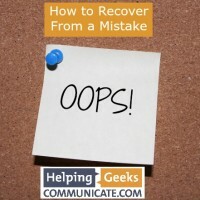 What do you do when you realize you’ve made a mistake? How do you handle it? [00:06:14] Well, two things I want to share with you. First, admit it as quickly as you possibly can. Don’t try to hide it. Disclose the error to the people who are directly affected by it. Just make the information known quickly. Secondly, be as specific as possible about the error. “I made a mistake. I was wrong when I thought this. And the impact of my error is…” And then ask, “How can we fix this? How can I make it up to you?” It’s as simple as that. [00:06:47] Now, it’s important when you are expressing your mistake, don’t hide, don’t make excuses, don’t justify, don’t be defensive. In fact, if the other person is upset by the information, let them be upset. And one thing to note here. Sometimes, people are upset even if your error was completely accidental. Even if your intent was nothing about them, it just happen to have an impact on them, people will get upset. If your action, or your inaction, your mistake somehow caused hurt to someone else, you need to apologize. It’s not about your intent. It’s about the impact you had on the other person. [00:07:37] Now, one of my clients is the owner of a fast food restaurant. And when I shared the sorry about the fries with him this week, he was shocked. He said, “It is not worth making a customer feel bad. I tell my team to tell the customer, ‘You’re right. I’m sorry.’ And get them whatever they want.” When it comes to mistakes, admit your mistakes clearly and quickly. And that’s today’s mentoring segment. [00:09:47] Now, the thing is this is a tough one. It’s big. At first, you’re just saying, “I’m sorry for the impact my actions had on you, and I own it. I’m sorry for that.” Then we ask them to acknowledge they were wrong. Now, this is tough. This is a big battle. It goes against our pride to say out loud, “I was wrong.” It’s huge. Now, it’s not only important for them to say, “I was wrong,” but also to be very specific. So I mentioned the Legos, right? Taking somebody else’s creation apart, I was wrong to do it without your permission. I was wrong. [00:10:26] Now, the third thing that we teach our kids to say is, “Will you please forgive me?” This is a business podcast. So I’m not going to go to deep spiritually. But I will say that because of our faith, we believe that when a relationship has been broken, there’s a need for forgiveness in order for there to be true reconciliation. So in our house, when there’s been a break in relationship because someone did something that was wrong that harmed somebody else, our standard is we insist the offender asks for forgiveness. [00:10:55] Now, look, I’ve been in the workplace long enough to know that this just does not happen at the office. And I’m not suggesting that you should strive to make that happen in your office. But what I am saying is that when you have a willingness to acknowledge the part you played in causing the problem that you and the other person are having, that goes a long way in restoring work relationships. And, yes, at our house, even Dad has to go to a kid sometimes, too often in fact, and say, “I’m sorry. I was wrong to do whatever it was I did. Will you please forgive me?” And that’s today’s family segment. Tom: [00:11:51] In today’s thought leader segment, I want to share with you something that happened as I attended an Agile conference. Now, this was a fascinating experience involving a series of round table discussions with Agile practitioner. [00:12:23] Now, the waterfall projects, the business analyst are critical to the success of projects. They provide a link between the technology people and the business people. Their job is to translate business language into technical language and to work with a technical team to make sure what gets delivered actually meets the needs of the business. [00:13:03] And I think that’s problematic because I think BAs can add huge value on Agile teams. But these practitioners sometimes believe that your product owner, that’s a new role, works directly with the development teams to represent the needs of the business. “And then why would we have these extra people who aren’t even really adding value?” Oh, my goodness. [00:13:27] So that brings us to the conversation around the table at the Agile conference. One team’s scrum master raised the issue he was having with a business analyst who seemed to be working against the interest of the project. Every day, she and that scrum master would have one conflict after another. Nothing was good enough. Nothing was right. The BA seemed to want to control every aspect of the project. How could this be resolved? [00:13:54] And we asked a lot of questions about the scrum master. We dove into a lot of areas and the conversation revolved around things like functional requirements, and prioritization of features, and backlog, and all those kinds of things, all these other elements relevant to Agile methodology. Now, the scrum master told us that he had chased down most of these ideas and had little success. Now, the group was stumped. We had no clear answers. But then one of the participants had a powerful thought. What if the problem was because the business analyst was actually feeling undervalued? [00:14:33] In the waterfall world, the business analyst was the source of truth, the oracle who had the answers about what the business needed. But now, some of that role was taken over by the product owner and other parts were handled by the scrum master and other team members. [00:14:49] The other participant asked, “Is it possible that your BA is struggling because she felt her contributions were no longer needed or no longer valued?” As we kicked this idea around, the scrum master felt this was a powerful insight that he had overlooked. He believed in the value the BA brought to the table and he did appreciate her contributions, but he acknowledged he had not made that clear enough to her and to the rest of the team. [00:15:15] Sometimes, when we’re dealing with a difficult team member, it’s because they need encouragement, affirmation, and respect. Sometimes, it’s a feeling of insecurity or disrespect that fuels the behaviors that are hurting your team. As the conversation continued, the folks around the table helped brainstorm ways the scrum master could legitimately and honestly express sincere appreciation to the BA for her work. [00:15:42] Now, I want to make clear and emphasize that we’re talking about sincere appreciation. I’m not saying you need to make stuff up or pretend like she’s adding more value than she is, but really find things that you appreciate and value about what she’s delivering. So let me ask you this. If you’ve got a difficult team member, is there a way you can express sincere appreciation for their contributions? And that’s today’s thought leader segment. Tom: [00:16:34] Today’s episode has really been about teamwork, working as a team member, really level two in the four levels of Thinking as a Geek Leader. Now, if you want more detail on the four levels of thinking, check out Season 1, episode 10, or you can download a copy of the four levels of Thinking as a Geek Leader from the episode page on brighthillgroup.com. [00:16:57] Now, today’s episode, we talked about showing sincere and honest appreciation for a team member’s contributions. We also talked about how my kids handle it or how they’re supposed to handle it when they blow it with a sibling. For today’s episode hack, I want you to think about whether you need to step up and acknowledge a mistake. [00:17:17] In the case of the Mars spacecraft, it was that conversion from pounds to newtons that caused the spacecraft to crash. Now, what I thought was fascinating about that experience is that engineers did have some indication that something was wrong because as it was headed to Mars, they had to make 10 times as many course corrections as they had planned to make. What I think is fascinating is no one took a look to see why they were wrong about all those course corrections, and is the end of the mission and a waste of a $125 million as a result. [00:17:50] So let me ask you, is there a way that you have been wrong that’s having an impact on the team. If so, first, admit it as quickly as you possibly can. Don’t try to hide it. Disclose the error to the people who are directly affected by it. And secondly, be as specific as possible. If you took apart their Lego creation, tell them you took apart their Lego creation and say, “I’m sorry. I was wrong when I did this. Here’s the impact. How can we fix it? How can I make it up to you?” And that’s today’s episode hack. [00:18:30] If you like the podcast, can I ask you to give me a hand? It turns out it’s a big deal to have a rating in iTunes. Now, I’ve heard other podcasters asking for ratings and reviews, and I wondered why they kept going after it again, and again, and again. Do you want to know? Because almost no one actually does it. It only takes a minute, and it’s a huge help. [00:18:54] So why is that? Great ratings helps iTunes decide that this podcast is worth promoting. And when you put up a rating or a review, it helps it appear as a top podcast in the iTunes search. Could you please take a moment to do it right now? There’re three simple steps. One, go to the iTunes store, podcasts. Two, search for Becoming a Geek Leader. And three, give the podcast a great rating. Thanks. [00:19:26] This is Tom Cooper. Thanks for listening. Be sure to join me next time for another episode of Becoming a Geek Leader. Join me and my mission of discovering better ways to lead others at work and at home.